A variety of optional features allow for extensive customization of the Genesis OPAL Model. Highlights of some of the optional features and descriptions are listed below. For a more extensive list of options, contact you local Garaventa Lift Representative or refer to the Genesis OPAL Model Design and Planning Guide. For low usage applications, full time battery operation is available. The drive is powered by a 24VDC battery pack charged from the building mains power by an integrated automatic charger. Continuous mains power is required if the lift is equipped with a fan and ventilation system. The Leadscrew model can be supplied with optional emergency lowering system which is automatically activated in the event of a power failure. Finishes for the Genesis OPAL model include the steel panels and aluminum extrusions to be painted from a large selection of RAL Colors. Garaventa can offer custom color matching, Graphic Imaging and Exotic Finishes. The panels can also be supplied with wood finishes, Formica, architectural metals or any material not exceeding 1/2" in thickness. The Garaventa Lift Power Door Operator (PDO) automatically opens the door/gate when the platform arrives at the landing. When the lift is at the landing, the passenger can press the call station switch or gently pull on the door or gate to activate the door opener. Power door operators are recommended with the lift has a ramp. Certain applications may limit the use of this operator. Consult you authorized Garaventa Lift Representative for which door operator is appropriate for your application. Keyed call stations can be supplied as an option and may be required in some jurisdictions. Keyed platform controls can be supplied as an option and may be required in some jurisdictions. The lift can be equipped with a hands free auto-dialer phone. This ADA compliant phone is activated by the push of a button and automatically dials pre-programmed numbers to summon assistance. It provides audible and visible feedback to the passenger that assistance is on the way. The phone is integrated with the platform controls and is flush mounted. This option will require the building owner to provide and maintain an active telephone line to the mast location. The ramp is attached to the platform assembly and travels with the platform. When the platform begins to travel upwards, the ramp folds up automatically, clearing the lower landing. 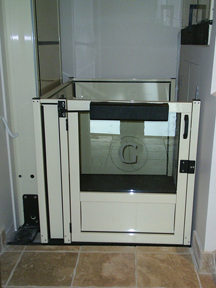 When the OPAL is installed as a floor mount unit, the lift can be supplied with a landing ramp that will provide a smooth transition to the platform. It is recommended that a Power Door Operator is installed for this kind of installation. 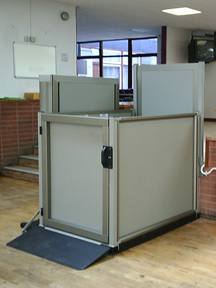 The lift can be equipped with a folding seat which is ideal for passengers who do not use a wheelchair. This allows the passenger inside the lift to travel up or down to the desired landing in the event of a power failure. The arrival gong option will provide an audible alert when the platform arrives at a landing. The digital floor display will show the direction of travel when the lift is in operation. It will also show the designated floor when the lift is stopped at a landing.